Home Therapies Nurses at Fresenius Medical Care North America (FMCNA) play an active role in our mission to provide exceptional quality patient care. Are you a fit for our Home Therapies team? Ready to find your place in our organization? Take a look at our current Home Therapies job openings. 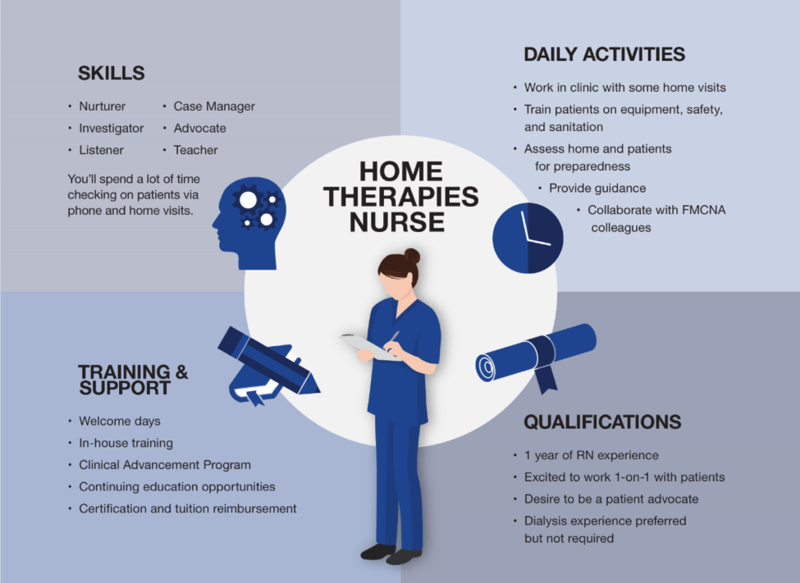 As a Home Therapies Nurse, you will have at least one year of RN experience. Your enthusiasm for working one-on-one with patients will shine as you prepare them for self-care and advocate for their health and safety. Your skills as a case manager, nurturer, and keen listener will ensure your success. In this role you will work in the clinic to train patients on equipment, safety, and sanitation. You will also make occasional home visits to assess the home and patient preparedness and provide guidance. To help you reach your career goals, FMCNA will provide you with in-house training, clinical advancement programs, and continuing education opportunities. You will be prepared for any and all challenges, and be supported every step of the way. At FMCNA, your health and well-being are our top priority. That’s why our benefits go beyond the basics. From health insurance and 401(K) plans to Employee Assistance Programs that offer confidential counseling at no cost, our benefits are tailored to meet your personal needs.